Super Savings Item! 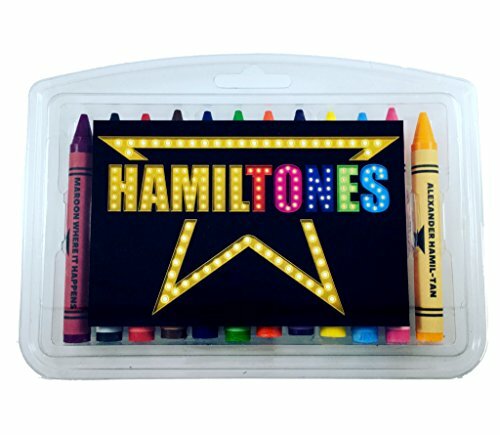 Save 31% on the Hamiltones Crayon Set - 12 Hamilton Musical Themed Colors by Theatre Nerds at Stickman's Blog. MPN: HamiltonesCrayons. Hurry! Limited time offer. Offer valid only while supplies last. These crayons are the perfect novelty item for any fans of Alexander Hamilton. The set features 12 colors filled with puns from the Broadway show. These crayons are the perfect novelty item for any fans of Alexander Hamilton. The set features 12 colors filled with puns from the Broadway show. The large size and clear plastic casing make them great for showing off to fellow Hamilton lovers. Color Guide: Alexander Hamil-Tan (Tan/Gold), Angelica (Pink), Elize (Light Blue), And Peggy (Yellow), Burr'ple (Purple), I Hope That You Burn (Orange), Your Daddy's Got Money (Green), Blue Us All Away (Dark Blue), Guns & Ships (Brown), Redcoats Redder (Red), It's Quiet Uptown (Black), Maroon Where It Happens (Maroon).